Have you ever had a heart break from a relationship? Have you felt that your childhood was not as happy as it could have been from neglect or abuse? We all either have experienced these things ourselves or know of someone who feels depressed from past events in their life. Many of us go around thinking we are okay or ignore feelings we do not want to face, until some event brings them to the surface. This is what happened to me. I thought I was okay, until a series of unfortunate events sent me over the edge. I was pink slipped at work, was fighting with my husband, and my best friend Dusty (13 year old Lab) died. I broke down and felt so depressed I could not get up in the morning. Then I knew I had to do something to heal myself of the pain I was feeling. I was on the internet one night and found a website that spoke of healing not only for people, but for animals too. Then I knew I needed to call Heather Green. I have to admit that being a teacher, I was a little skeptical of whether talking to someone could heal me of my pain. I was anxious about meeting Heather. When I started talking to Heather that first session, she was very calming and patient. I had not really told her anything about myself other than I was depressed and needed help. She did an energy scan of me and told me what she saw. I stared crying my eyes out, because she was right on with her analysis of where my pain was coming from. I had been hurting for so long, she helped me to see the things that I had buried since my childhood and take ownership of them. She is very perceptive, intelligent, and gentle. With her guidance, I have been able to start healing my depression. I know now that clairvoyant healing can work even for a skeptic like me. 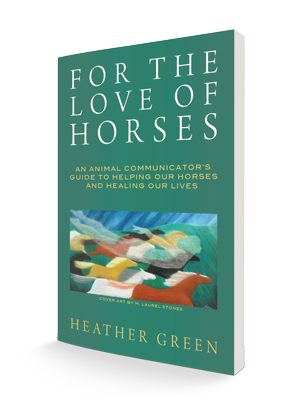 I also attended a class that Heather offered about animal communication, specifically with horses. I was very interested, since I have always had a special bond with animals. She had some great insights as to how animals and people can work together to understand each other. She said horses especially are sensitive to people’s emotions. They sense and read us very well. If we learn to read them too, we could be more tuned in to each other’s needs and wants. Through Heather’s advice and guidance I have since gone from a hurting, depressed woman, to one who is finally feeling free and alive. She has been a blessing to me.